This site is quite scary, at least in my opinion. 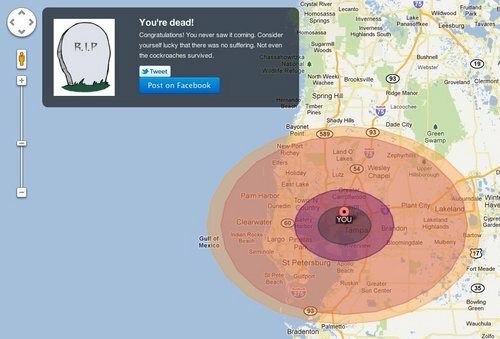 All you have to do is to tell the site where you’re at and the site will show you a map of how bad the cities around you will be affected by a blast. Scary, but I guess a good way of telling us how terrible these weapons are. iPhone Photo App review – Photo Toaster Jr. I linked your post on my twitter page. I would survive, but not for long, so stop nuclear weapons and nuclear electricity!! !